Balancing On My Toes: Life Lately: Oh TWOdles! We had another baby-filled weekend around here with another birthday party! Emma turned two last week and her Mickey Mouse Clubhouse themed birthday party was a blast! Emma is obsessed with Mickey Mouse and constantly is saying "oh Toodles" so this was a perfect theme for her party. 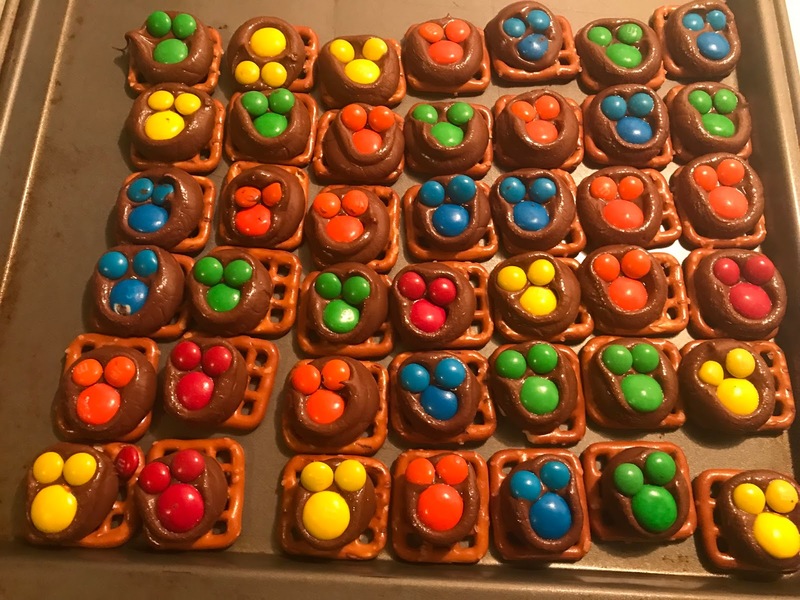 Brittni had asked me to make Mickey mouse versions of my pretzel treats and Emma was loving them! She immediately started pulling them off the plate and kept trying to get adults to give them to her. She's hard to say no to! To make them you simply have to place a hershey kiss on a pretzel (I use butter snaps) and put in the oven for about three minutes on the lowest setting. Take them out and the hershey kiss should be nice and melted. Press a large m&m into the center and two mini m&ms in the same color above to create Mickey's head and ears. I then place them in the fridge for at least 24 hours before I serve them. 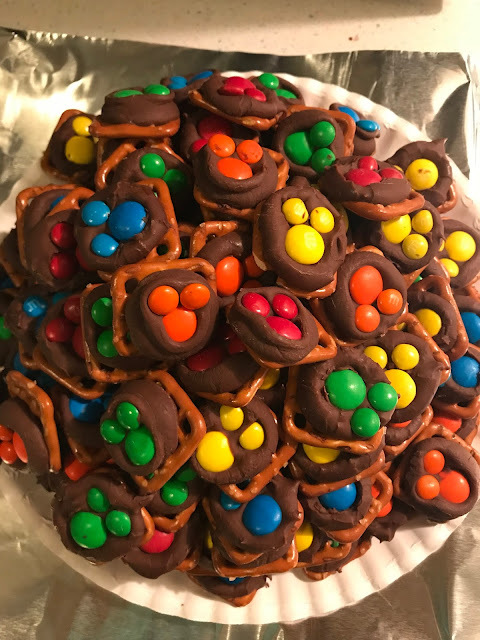 They are always a crowd pleaser whether you put them in the shape of Mickey Mouse or just place one M&M inside like I've done in the past. Tim and I took a selfie with two of our three nieces. The best part about best friends is that when they have kids they become your nieces and nephews! Even when they aren't related by blood they are some of my favorite people to hang out with! You can see my recap of Tilly's first birthday from last weekend here. Tim is determined to turn Emma into an Eagles fan. We all have different teams we are fans of so we shall see who she decides to choose! Tilly was having a great time running around with this walker! She is on the move now and is running! After not getting a ton of time with her at her party last week it was so nice to hang out with her! She was also more interested in eating the cookies they were supposed to be decorating then actually decorating them. I can't blame her! How sweet is Tilly in this picture?! Emma's cake was perfect with all the Mickey characters- she loved it! Brittni's sister brought a blow up bouncy house for the little ones and Tilly was a little apprehensive about it! Emma climbed right on my lap to eat a pretzel. Love this little girl! My other little love Tilly holding my hand while Emma sits in my lap- my heart just melts when these girls love on me! Overall it was a wonderful Saturday afternoon birthday! Brittni and Stephen asked for money in lieu of gifts so they can purchase a swing set for their backyard. It was such a nice idea and when I mentioned it to my mom she said they did something similar for my brother and I when we were little. Great minds! After the party we stopped home quickly and then headed off to the Warwick Mall to do a bit of shopping since we both had gift cards burning holes in our pockets. After a little shopping at Old Navy we decided to eat dinner at Buffalo Wild Wings. We picked Buffalo Wild Wings because we had a gift card but I was not impressed with my buffalo mac and cheese! It just wasn't great and I wouldn't necessarily choose to eat there again in the future. Tim did like his wings though! We headed home shortly after and decided to watch All I See Is You starring Blake Lively (she is my ultimate girl crush---I mean who has hair as beautiful as hers? No one!) I was pretty disappointed that the movie wasn't as great as I thought it would be. Definitely not one I would recommend. On Sunday we had an event to attend at Quidnesset Country Club in North Kingstown. Tim coaches football and his team had their banquet on Monday. We enjoyed a yummy meal and it's always so funny to see the kids interact with Tim. After the banquet we spent the night hanging out at home! It was another quick, fun weekend! Life Lately: Tilly Turns One!